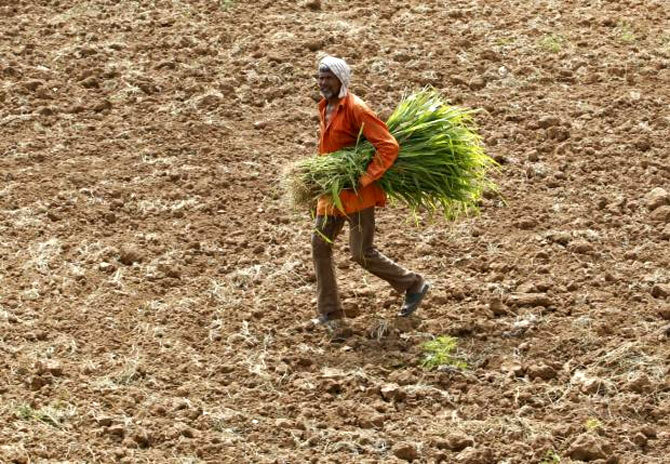 In spite of Budget's rural focus, the government has consistently stumbled in agriculture, says Shreekant Sambrani. IMAGE: A farm worker carrying fodder walks in a dried paddy field on the outskirts of Ahmedabad. Photograph: Amit Dave/Reuters. Judging by the mostly positive comments about the supposedly rural bias of Budget FY 2017 from both the talking heads on television and in newspaper columns, one could be forgiven for thinking that this government invented agriculture, irrigation, and public works as prime areas of concern of economic policy. The Budget earned its claim of being oriented towards village India largely because, as this paper editorially noted, "spending on agriculture and irrigation - the latter the focus of a new scheme in this government - went up by 85 per cent. The finance minister used the word 'rural' 25 times in his speech". But a closer look would show things in a somewhat different light. Dr Ashok Gulati observes that although the allocation to the ministry of agriculture, at about Rs 36,000 crore (Rs 360 billion) for FY 2017, shows an increase of over Rs 20,000 crore (127 per cent) over the last year, the bulk of it, Rs 15,000 crore (Rs 150 billion) for interest subsidy on short-term loans, is simply on account, being transferred from the department of financial services. The actual net increase would be far more modest. Similarly, the corpus of Rs 20,000 crore (Rs 200 billion) is being publicised as a new initiative. But the government had announced last year the creation of a corpus of Rs 50,000 crore (Rs 500 billion) for the Pradhan Mantri Krishi Sinchai Yojana, something that Mr Jaitley mentioned emphatically in July 2015 while inaugurating the Annual Day Seminar on agrarian distress organised by the National Bank of Agriculture and Rural Development. The actual allocation this year of Rs 7,400 crore (Rs 74 billion) is in fact marginally lower than the revised estimate of Rs 7,600 crore (Rs 76 billion) for the last year. 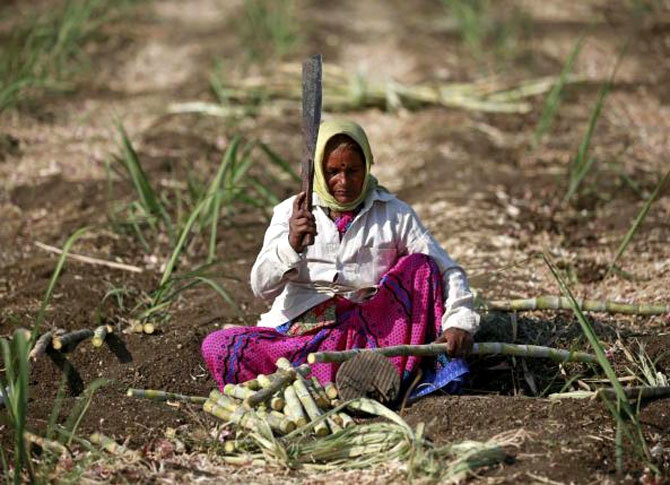 IMAGE: Parubai Govind Pawar, a 55-year-old female worker cuts sugarcane in a field in Degaon village in Solapur district in Maharashtra. Photograph: Danisgh Siddiqui/Reuters. The Mahatma Gandhi National Rural Employment Guarantee Scheme (MGNREGS), a bugbear of the Modi campaign in 2014, is something the government has lately taken to heart. But its allocation of Rs 38,000 crore (Rs 380 billion) falls short of the Rs 41,000 crore (Rs 410 billion) it received in FY 2011. Other initiatives which have found prominent mention in the Budget speech, such as a national grid for produce marketing based on electronic platforms, are also carry-forward items from earlier. The one new initiative (out of the seven that the prime minister counted out in his Lok Sabha speech on March 3) is the new insurance scheme. It is still an article of faith, since much fine print and actual experience will show its true colours. Rural concerns have been integral parts of policy-making in India since Independence, notwithstanding the current publicity drum rolls that suggest otherwise. Irrigation to reduce the monsoon-related vulnerability of agriculture was the cornerstone of Nehru's plan strategies. The Second Five-Year Plan (1956-61) accommodated agriculture formally into the planning methodology through the Mahalanobis model. The intensive agriculture district and area programmes which aimed to provide crop-specific inputs and advice have been parts of the plan strategies ever since their introduction in the Third Plan (1961-66). And though spurred by the droughts of 1965 and 1966 and endowed with generous intellectual and resource assistance from the United States, the Green Revolution that changed the face of Indian agriculture would not even have started without government sponsorship. Subsidies for inputs introduced then and support prices initiated in the Indira Gandhi regime of the early 1970s are now permanent fixtures of the rural scene. Closer to the present, the United Progressive Alliance in its decade in power wrote off Rs 70,000 crore (Rs 700 billion) of agriculture loans, started MGNREGS, a dole in reality disguised as entitlement, and steadily increased support prices of all crops, risking runaway food and general inflation for the better part of its tenure. And Mr Pranab Mukherjee gifted away Rs 300 crore (Rs 3 billion) each to numerous pet schemes in his Budgets, a practice Mr Jaitley followed in his two Budgets albeit with different allocations. So, to extend the question the prime minister has been asking about the continuing necessity of MGNREGS-type relief, why is Indian agriculture and half of the Indian population that depends on it in such distress after more than sixty years of government attention and interventions? That question does not seem to have bothered policy makers earlier, as indeed it has not even now. Government programmes have often made available large amounts of resources. But almost invariably, they are accompanied by a pre-set prescribed design, not amenable to flexibility in view of local conditions, or a "one-size-fits-all" approach. Objective evaluations by reputed international agencies and scholars have shown this to be true even of a programme such as MGNREGS, which was explicitly mandated not to follow the approach. The outcome was invariably measured in terms of expenditure targets met or positions created. Even after it was modified to include performance budget methodology, the results were seen in physical terms: length of canals and roads constructed, market yards built, and so on. The effectiveness parameters, such as the impact the programmes had on increasing productivity of specific crops, leave alone relieving agrarian distress or reducing rural poverty, were left for research studies undertaken not always at the government's instance and after some considerable lapse of time. 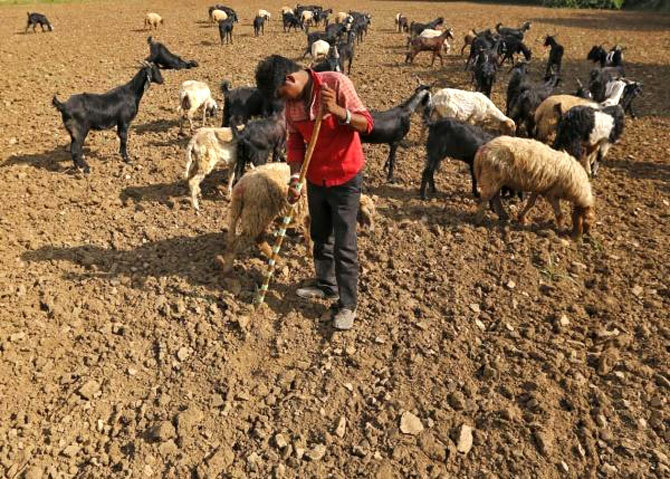 IMAGE: A shepherd grazes his sheep in a dried paddy field on the outskirts of Ahmedabad. Photograph: Amit Dave/Reuters. Consequently, there was little learning from the experience. In plan after plan, programmes were repeated or extended; even when new schemes were taken up, they more often than not followed the old template. The result mostly was a replication of tried, trusted but failed programmes, for the simple reason that the administrative machinery had developed a comfort level with them. This situation was further complicated by the fact that except for the early years of the Green Revolution, the programmes provided no hand-holding support for the last mile. They brought resources to the threshold of the problem, but left the availing of them in a judicious manner entirely to the people, whose familiarity with what was to be attempted was very low. This is akin to providing a bicycle to a person who can barely stand up, and assuming the mobility problem to have been solved. The person unable to manage the contraption either resorts to throwing it away or selling at any price, and the problem remains. The absence of last mile support also created a class of persons or organisations who did this for a price. This caused the leakage of resources that is often associated with most development programmes, be it siphoning off of loans and subsidies for purposes other than those intended, or the usurpation of MGNREGS benefits by those not meant to be covered by it. This approach has in effect amounted to the government throwing money at the problem in the hope that it would make the problem go away. The Budget for FY 2017, sadly, continues the same pursuit.